If there’s anything that protects your building against almost all of the damaging external elements, it is most probably the roof. Without a fully functional commercial roofing system, your property is at risk to many problems including leaks, visible wear and tear and other costly damages. Although roofing materials are designed to withstand most environmental pressures, it could be a lot different in Arizona. 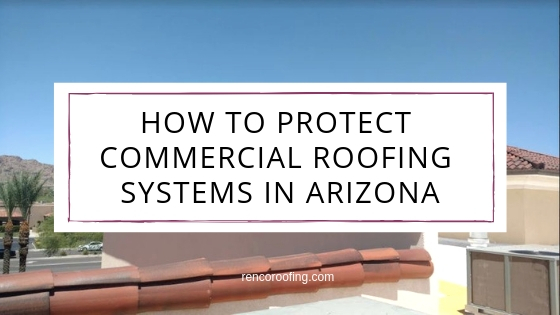 In Arizona, the year-round cloudless skies can be tough on your roof. The extreme heat, dryness and winds during the monsoon season can cause all kinds of roof damages you can ever imagine. With the constant exposure to harmful ultraviolet rays, your property’s roofing materials may deteriorate faster over time. Knowing what to do to prevent your roof from getting damaged can save you from having to fix major problems and spending a fortune on repairs or roof replacement. In this guide, you’ll find out more ways to protect your commercial roof. If you are a building owner or a facility manager, one of your greatest concerns is the maintenance and protection of your roof. Here are some things to think about to keep your flat roof in good shape. Proper Design: It pays to be careful in considering every design detail such as the structural design, penetration, roof type and materials to be used. Good roof design can help add more years to your roof’s longevity. Effective Drainage System: When the strainers and scuppers of your flat roof drainage system get clogged, water tends to back up. As water backs up, it gets suspended on your roof. Water infiltration is the last thing we want to happen in any roof. Proper Roof Ventilation: Without adequate ventilation, there would be no proper regulation of temperature and moisture levels in the attic. Heat and moisture can lead to damages on your roof insulation, sheathing, rafters and shingles. Commercial Roof Maintenance Plan: When was the last time you had an inspection for your roof? Like us, the roof can get ‘sick’ as well. The extreme heat in Arizona can cause roofing roofing materials to crack. Early detection is key, which is why it is important to have your roof inspected at least twice a year. Professional roofers should be able to provide a comprehensive roof maintenance program to a preventative measure. They are capable of carefully assessing your roof and figure out the best maintenance program tailored to your commercial roof. If you want to ensure maximum protection for your commercial roofing system, your best bet is by getting your roof a preventative maintenance plan. With it, the lifespan of your roof gets extended significantly. Consider it a wise investment for your property. By working with the best roofing contractor to do the job, your roof won’t be causing you any headaches for the many years to come. A comprehensive commercial roof preventative maintenance program is a set of services offered by a professional roofer to ensure that your roof stays at its optimal working condition. It includes a regular roof inspection which is needed for any type of building. Through roof inspections, you will be able to find potential damages and repair them before they get worse. Another essential part of preventative maintenance program is the regular roof repair and cleaning. If you want your roofing system to last longer, you can also opt to add reflective roof coating. For you to stay on top of your commercial roof maintenance, you need to have it inspected regularly and properly. With regular roof inspection, you can extend the lifespan of your commercial roofing system. It is recommended to have it checked twice a year or immediately when you notice any potential damage on it. As your roof gets inspected, you may ask the roofer to do some basic roof repairs while they’re at it. A few minor repairs won’t hurt as much as potential major repairs if left untreated. If you want to get the most out of your commercial roof, you may want to have it regularly cleaned. A clean roof prolongs the life of the membrane. It also maintains a lower surface temperature which makes it more energy efficient. With regular cleaning, you prevent it from deteriorating as well. Using a roof coating is an economically wise choice. It costs half as much as a roof replacement and is less expensive than installing a second roof. Although it is not the ultimate solution for all your roofing problems, it can surely help in extending your roof’s lifespan. A reflective coating decreases the load on your HVAC system. Thus, it decreases your energy consumption, as well. Our team of roofing experts here at RENCO Roofing has only provided top quality workmanship on roofs throughout Arizona since 2004. Throughout the years, no matter how big or small your roofing project is, we strive to provide the highest level of workmanship and customer service. By working with us, we’ll guarantee that you’ll be able to see the difference, the RENCO Roofing difference. Feel free to give us a call at 602-867-9386.